As we make our way deeper into the summer months our garden at Post Ranch is filled with heirlooms tomatoes, summer squash and a variety of shelling beans. Of all the iconic summer ingredients, shelling beans may be one of my favorites. From the inky-purple Trail of Tears beans to the mottled pink Cranberry Bean, each variety has its own rich history and vibrant colorings. Many people don’t find fresh beans worth all of the effort that goes into shelling them, however, I think the texture and flavor of mid-summer beans well worth the time. 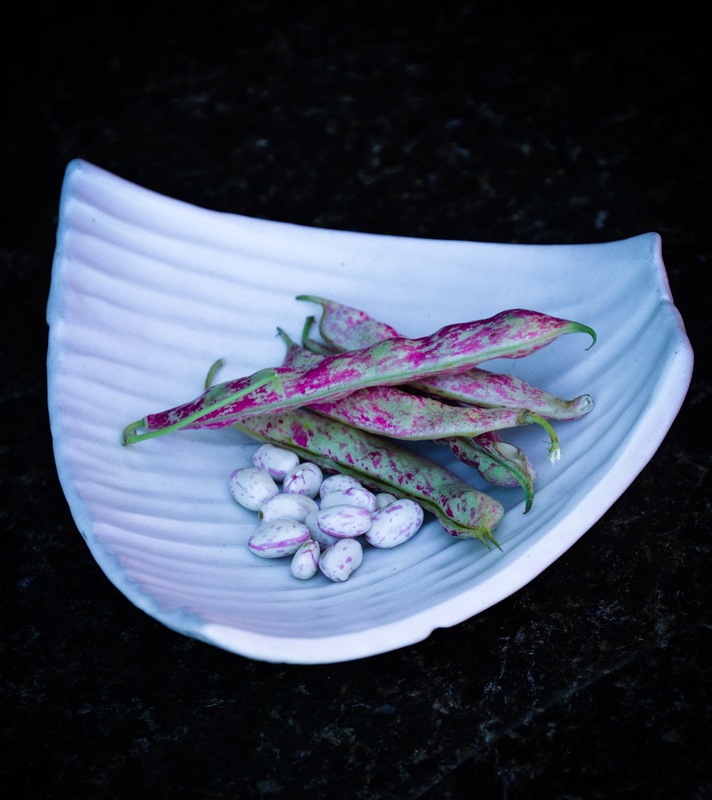 Here are a few tips for cooking fresh shelling beans. Unlike dried beans that need to be soaked, fresh shelling beans can be cooked right out of the shell. Start with a large pot of water - use at least ten cups of water for every cup of shelled beans. Do not mix different varieties of beans - each type has their own unique profile and cooking time. Remember that only a fraction of the flavorings you add into the water will permeate the center of the bean. I like to start the beans out with one or two small fresh bay leaves, a few cracked garlic cloves and a couple of toasted guajillo chiles. You can wrap these aromatics in a cheese cloth so it is easy to strain them later. Smoked ham hocks, smoked onion, cumin and coriander are just a few things with which you might consider flavoring the pot. Take your large pot filled with water, beans and aromatics and slowly bring it to a simmer on the stove. Don’t add any salt at this time. Slowly simmer the beans, gently stirring to evenly cook. You may also use a lid to keep the steam in the pot and speed cooking. Low and slow is the key here. Once you taste a bean and it has started to become tender add kosher salt to the pot. I like to season the water until it is unpalatably salty. Again, only a fraction of the seasoning makes it into the beans. Fresh shelling beans can take anywhere from 20 minutes to an hour to cook. Once the beans have become al dente, and have just a little raw bit left in the middle, remove the pot from the heat and let it cool at room temperature with the lid on. Every 5 or 10 minutes remove a bean from the pot and check it. Adjust salt and seasoning as needed during this stage. Once the beans reach the perfect consistency add a touch of aged sherry vinegar to stop the cooking process. Even if the broth remains hot, the beans will not soften more once the acid is added. Keep the beans inside the broth until ready to use. Ideally the beans should soak in the liquid for at least 2 hours. If you know you will be storing the beans overnight, you might consider using less salt as the longer the beans sit in the liquid the more salt and seasoning will get through the skin. Can just beans be used if I don't get shelling beans. Hi Suzain- You can definitely use any number of fresh or dried beans. The same cooking tip apply. If you are using dried beans i would suggest soaking them the night before you plan on cooking them.